Artificial limbs have been used since early history to replace arms and legs lost to injury or disease. The Greek historian Herodotus mentioned wooden feet in a writing from 500 B.C. An early Roman mosaic (a large artwork often created from colorful tiles) features a figure with a peg leg (a wooden artificial limb). Medieval knights had simple artificial limbs made to improve their appearance. But artificial limbs are only appendages, things that are attached to the outside of the body. While these limbs must be well-designed and useful, they do not pose the same challenges to surgeons and researchers as artificial joints. Joints are the movable points of the skeleton where two bones come together, such as at the knee, hip, or shoulder. An artificial joint must be implanted (placed) in the body and designed with the same shape and functionality as the connective tissue it replaces. The materials used in hip replacement surgery must be designed to ensure that a patient's mobility is not seriously hindered. 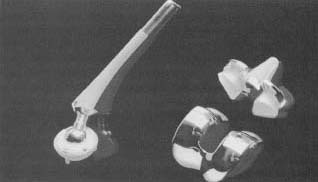 arthroplasty was performed in 1951; ten years later the first total hip replacement occurred. Shoulder replacements began in the 1960s. Artificial joints are secured in place either by cement or by a relatively new process called bone ingrowth. In the bone ingrowth process, natural bone material (blood vessels and cells) invades the porous (full of very small holes) surface of a synthetic prosthesis (a man-made device, such as a limb, ligament, or bone, that replaces natural material), eventually breaking it down. Complications from replacement surgery include the loosening of the joint's components (parts) and infection, but both problems are fairly uncommon. While a return to normal functionality is not always possible with joint replacement, most patients realize some measure of enhanced mobility and pain relief. Research is ongoing to improve prosthetic materials, surgical techniques, ways of securing the joints, and postoperative mobility.